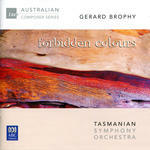 Forbidden colours / Gerard Brophy ; Tasmanian Symphony Orchestra. Le Reveil de l'ange : per pianoforte e orchestra da camera / Gerard Brophy. Instrumentation: Solo piano, 2 flutes, 2 oboes, 2 clarinets, 2 horns, 2 trombones, percussion (1 player), strings (6.6.2.2.2). Commission note: Commissioned by Australian Chamber Orchestra. First performance: by Australian Chamber Orchestra — Aug 87. Aug 87: featuring Australian Chamber Orchestra.